Hans Christian Andersen was the first Danish author to emerge from the lowest class. He enjoyed fame as a novelist, dramatist, and poet, but his fairy tales are his greatest contribution to world literature. 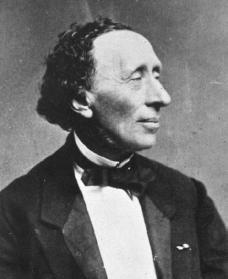 Hans Christian Andersen was born on April 2, 1805, in Odense, Denmark. His father was a shoemaker, and his mother earned money washing other people's clothes. His parents spoiled him and encouraged him to develop his imagination. At the age of fourteen, Andersen convinced his mother to let him try his luck in Copenhagen, Denmark, rather than studying to become a tailor. When she asked what he planned to do in Copenhagen, he replied, "I'll become famous! First you suffer cruelly, and then you become famous." For three years Andersen lived in one of Copenhagen's most run-down areas. He tried to become a singer, a dancer, and an actor, but he failed. When he was seventeen, a government official arranged a scholarship for him in order to give him a second chance to receive an education. But he was a poor student and was never able to study successfully. He never learned how to spell or how to write in Danish. As a result his writing style remained close to the spoken language and still sounds fresh today, unlike the work of other writers from the same era. After spending seven years at school, mostly under the supervision of a principal who seems to have hated him, Andersen celebrated the passing of his university exams in 1828 by writing his first narrative. The story was a success, and it was quickly followed by a collection of poems. Andersen's career as an author had begun, and his years of suffering were at an end. In 1835 Andersen completed his first novel, The Improvisatore, and he published his first small volume of fairy tales, an event that attracted little attention at the time. The Improvisatore, like most of Andersen's novels, was based on his own life. It was a success not only in Denmark but also in England and Germany. He wrote five more novels, but as a writer of drama, Andersen failed almost completely. Many of his poems are still a part of popular Danish literature, however, and his most lasting contributions, after the fairy tales, are his travel books and his autobiography (the story of his own life). A lifelong bachelor, Andersen was frequently in love (with, among others, the singer Jenny Lind). He lived most of his life as a guest at the country homes of wealthy Danish people. He made many journeys abroad, where he met and in many cases became friends with well-known Europeans, among them the English novelist Charles Dickens (1812–1870). Andersen began his fairy-tale writing by retelling folk tales he had heard as a child from his grandmother and others. Soon, however, he began to create his own stories. Most of his tales are original. The first volumes written from 1835 to 1837 contained nineteen stories and were called Fairy Tales Told for Children. In 1845 the title changed to New Fairy Tales. The four volumes appearing with this title contained twenty-two original tales and are considered Andersen's finest works. In 1852 the title was changed to Stories, and from then on the volumes were called New Fairy Tales and Stories. During the next years Andersen published a number of volumes of fairy tales. His last works of this type appeared in 1872. Among his most popular tales are "The Ugly Duckling," "The Princess and the Pea," and "The Little Mermaid." At first Andersen was not very proud of his fairy-tale writing, and, after talks with friends and Danish critics, he considered giving them up. But he later came to believe that the fairy tale would be the "universal poetry" (poetry that exists in all cultures) of which so many romantic writers dreamed. He saw fairy tales as the poetic form of the future, combining folk art and literature and describing both the tragic and the comical elements of life. Andersen's tales form a rich, made-up world. While children can enjoy most of the tales, the best of them are written for adults as well. The tales also take on different meanings to different readers, a feat only a great poet can accomplish. Andersen died in Copenhagen, Denmark, on August 4, 1875. Bredsdorff, Elias. Hans Christian Andersen. New York: Scribner, 1975. Wullschläger, Jackie. Hans Christian Andersen: The Life of a Storyteller. New York: Knopf, 2001.